It was a lonely toy bear on an otherwise empty shop shelf on Christmas Eve in 1956 that first captured the attention of Michael Bond. Enamored, the BBC employee brought the stuffed bear home to his wife. 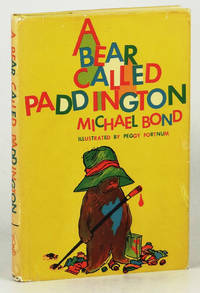 They named the bear Paddington after the station near their home in London, and thus inspired, Bond began to write a few cute stories about the bear's adventures. The special little bear continued to whisper stories to Bond, and by October 1958 we were all introduced to "A Bear Called Paddington". "Bears like Paddington are very rare. And a good thing too, if you ask me, or it would cost us a small fortune in marmalade." A very successful series followed the publication of that first book, and by 1965, Bond was able to devote himself to his writing full-time. While he never fully gave up on Paddington, he also introduced us to a few new characters, like a mouse called Thursday and a guinea pig called Olga da Polga. Bond is also known for his adult book mystery series featuring a detective called Monsieur Pamplemousse. "It's as I said in the beginning ... young [Paddington] Brown has a way of bringing people closer together in the end." The wellie-wearing bear called Paddington has remained the most popular character created by Michael Bond, with over 20 books, TV shows, movies, and toys created from that lonely little bear in a shop on Christmas Eve. Michael Bond passed away at home from an illness at the age of 91 on June 27, 2017.